Family grudges and bitter rivalries erupt when Danny (Adam Sandler), Jean (Elizabeth Marvel) and Matthew (Ben Stiller) meet in New York. Each Meyerowitz sibling lives a very different life. However, they are united by their challenging relationship with difficult father, Harold (Dustin Hoffman). preferred child, Matthew also feels at odds with his father. When Harold needs the help of his three emotionally damaged children, just how will they respond? Click Here And Never Miss A Film Review Or Movie Feature! No one portrays the stress of city parking like Noah Baumbach. As in his 2005 film, The Squid & The Whale, The Meyerowitz Stories (New and Selected) features a father and child driving in circles desperately trying to find a parking space. This New York vignette is not the only similarity between these two films. Indeed, Baumbach returns to many of the themes of legacy, self worth and parental conflict that he explored in The Squid & The Whale. Both movies feature extremely divisive father figures who value themselves and their ‘work’ (art in The Meyerowitz Stories, writing in The Squid & The Whale) over and above the wellbeing of their children. However, The Meyerowitz Stories approaches this relationship from a different perspective - that of the lasting emotional impact on the now adult children. The result is an incredibly smart, thoroughly enjoyable bittersweet comedy. However, watch out - those Meyerowitz stories have some pretty sharp edges. Each of the Meyerowitz stories is brilliantly portrayed thanks to the fim’s impressive cast. Harold, Danny, Jean and Matthew may not always be warm - or even particularly likeable - characters but they engage and fascinate us nonetheless. Dustin Hoffman is a prickly joy to behold as Harold - his best role in years. Meanwhile, Emma Thompson is as wonderful as ever (and borderline unrecognisable) as Harold’s flighty, alcoholic wife, Maureen. Baumbach regular, Ben Stiller, shines as Matthew. He is given many moments of pure comedy gold - a scene in a car park had me in stitches. Stiller is also able to convey the humour in scenes that are actually rather heartbreaking and pretty uncomfortable to watch. Harold’s parenting certainly leaves much to be desired. Meanwhile, the film’s heart lies with Jean. She is the most intriguing character of the bunch and Elizabeth Marvel gives a lovely and nuanced performance. However, the standout role in The Meyerowitz Stories comes from one Mr Adam Sandler. Proving (as all those who love Punch Drunk Love already know) that he is capable of so much more than his recent spate of lazy ‘comedies’, Sandler is superb as Danny. While the film spends time on the stories of his father, siblings and his daughter, Eliza, it always returns to Danny. In the end, this is Danny’s journey and we are glad to share it with him. 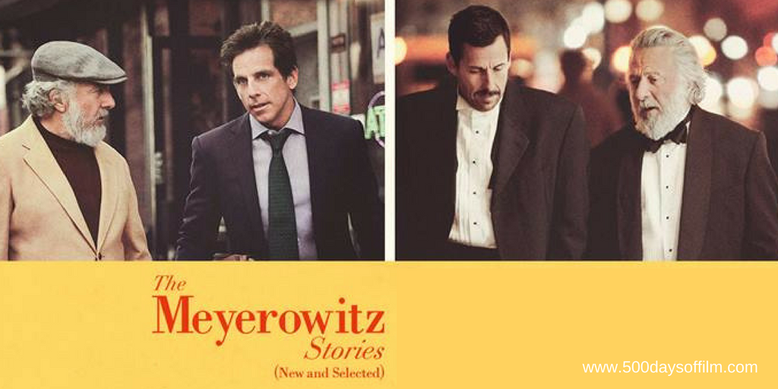 Have you seen The Meyerowitz Stories? If you have, what did you think of Noah Baumbach’s film? Let me know in the comments section below or via Facebook or Twitter (@500DaysOfFilm).